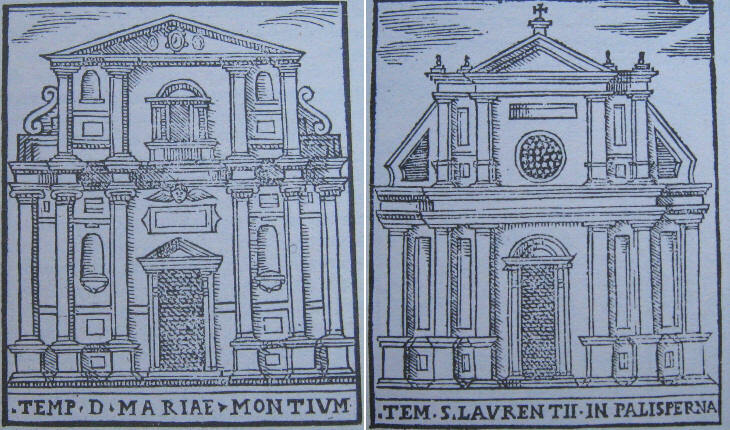 The last section of the guide covers the churches of Rione Monti. It was the largest rione, but not the most populated; the area to the east of Via Merulana, the street linking S. Maria Maggiore and S. Giovanni in Laterano was split into large villas, including that of Pope Sixtus V; the western part of the rione housed many monasteries and almost all of the churches shown in this page belonged to a religious order. In Roma Sancta, a manuscript written in 1581 by Gregory Martin (*) the decay of the monuments of Ancient Rome was described with enthusiasm: Forum Romanum (was) as solenne a place then as westmester and westmester hal, is now the oxe fayre, called Forum Boarium. The triumphal vaultes sometime most sumptuous in the honour of their victories, come daily to nothing. The few buildings of the Forum which were not a pile of rubble were those which were turned into churches. S. Adriano was ancient Curia Julia, the building which housed the meetings of the Roman Senate; it was turned into a church by Pope Honorius I in 638 and dedicated to St. Hadrian, a Greek martyr during Diocletian's persecution. In the VIIth century Rome was a Byzantine possession and this may explain the dedication. Senators continued to meet in this building until 1143, when they moved to Palazzo del Campidoglio. During the Middle Ages the senators (in some periods a single senator) assisted the pope in the administration of the City of Rome. 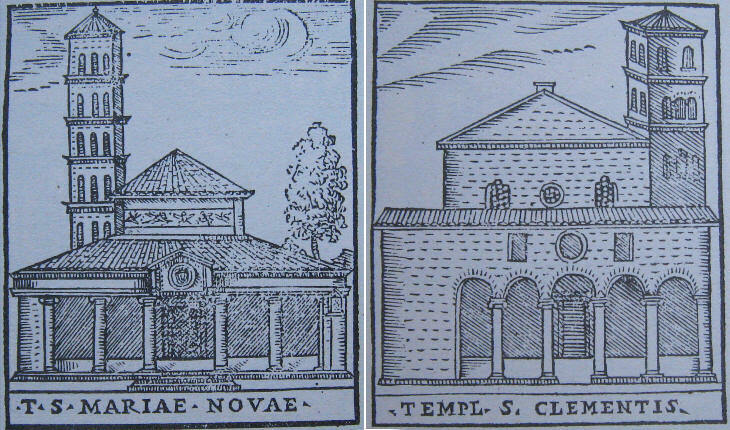 While the interior of Curia Julia was modified by the creation of naves and chapels, its external appearance was that of a (crumbling) ancient building. The illustration shows a bell tower which was pulled down in the next few years, because a 1616 engraving does not show it any longer. The illustration of SS. Cosma e Damiano shows the entrance to the church from the Forum, through an ancient Roman building. Between 1626 and 1632 this entrance was significantly raised in order to prevent the church from being flooded. The coat of arms shown in the illustration belongs to the Medici family (there were three popes of that family during the XVIth century). The bell tower was pulled down in the XVIIth century. The arches to the left of the church are meant to be those of Basilica di Massenzio, but this building is located to the right of the church. 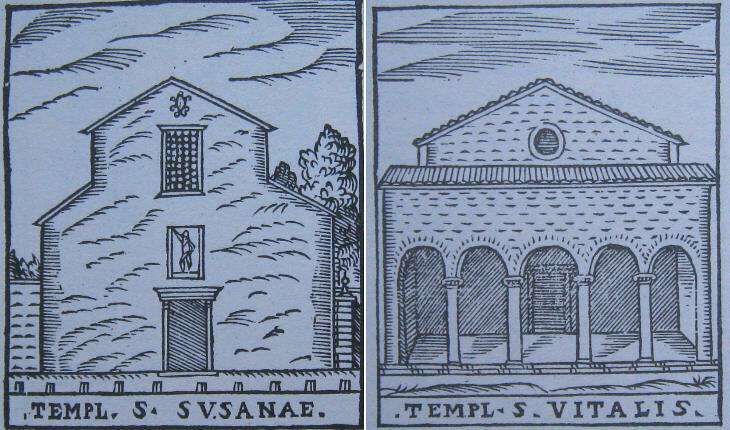 The illustration shows S. Maria Nuova before it was given a new façade (1615). The old church had a porch supported by six Ionic columns and it was decorated with mosaics. A sacred image stood at the centre of the façade. Many Renaissance and Baroque churches have a porch, however in medieval churches this component of the building shows its purpose in a clearer manner. The porch allowed those who were not eligible for admittance into the church to hear the service. In the early days of Christianity baptism was given to adults and only at the end of a period of instruction; catechumens (those who are instructed) did not enter the church. Also some sins were punished with the obligation of staying away from the community of believers. S. Clemente had a Romanic bell tower which was replaced by a small Baroque one; also the medieval porch was replaced by a Baroque one, which however retained the ancient columns. The guide mentions a sacred image (Sacello della Madonna) near S. Clemente and it explains why it was so venerated. According to the guide the image of Virgin Mary spoke to Pope Gregory the Great; the pope granted special indulgences to those who prayed at it. SS. 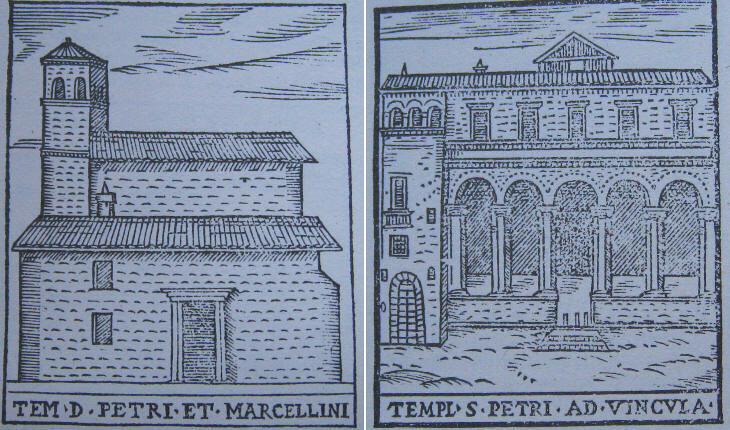 Pietro e Marcellino was entirely rebuilt in the XVIIIth century; most likely the illustration shows the side entrance to the church because other sources depict the church with a more elaborate façade. In 1588 the role of Emperor Constantine as the great benefactor of Christianity was widely accepted. The Donation of Constantine, a medieval document conferring privileges and possessions to the pope and to the Roman Church, was known to be a forgery, yet the accounts of smaller donations made by Constantine were still regarded as true. According to the guide the emperor donated to this church: una patena d'oro di libre trentacinque, quattro candelieri dorati di dodici piedi l'uno, tre calici d'oro ornati di pietre pretiose, un'altare d'argento di libre duecento, & un vaso d'oro di libre venti (a 35 pound gold paten - the plate for holding the bread during the Eucharist -, four gilded chandeliers having the height of twelve feet, three gold chalices decorated with precious stones, a silver altar weighing 200 pounds and a gold vase weighing 20 pounds). S. Pietro in Vincoli is usually linked with the Della Rovere popes (Sixtus IV and Julius II). At the end of the XVIth century a third name was associated with the church: that of French Cardinal Antonie Perrenot de Granville. The windows bear the inscription "ANT. CAR. GRANVELANUS". He was a close advisor to Emperor Charles V (he was born at Besançon, which now is in France, then in Franche-Comté, an Imperial territory). For many years he was involved in negotiating peace agreements and marriages and in acting as prime minister (Netherlands) or viceroy (Naples). He paid little attention to his ecclesiastical career, but in 1561 his political achievements granted him the cardinal's hat. In 1570 he was sent to Rome by King Philip II of Spain. Here he helped to arrange the alliance which eventually led to the Christian victory at Lepanto. During this assignment he promoted the completion of S. Pietro in Vincoli. 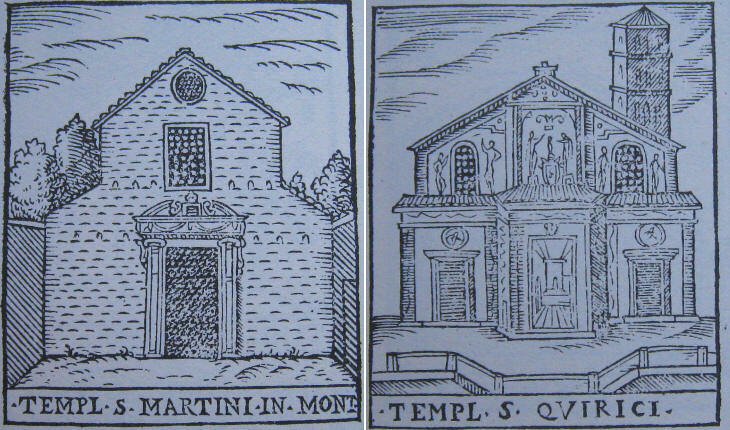 In 1588 S. Maria ai Monti was the newest church of Rome. From Pope Gregory XIII to the humblest citizen, everyone contributed to its construction; this owing to a miracle which occurred in 1580 when an old blind woman regained her sight by praying at an image of the Virgin Mary: this was painted in a former monastery, but in 1580 the building was in ruin and the room with the painting was used as a hayloft. Roma Sancta described the construction of the church with these words: (..) this yere also 1580 April 26 was there a miraculous Image of our Lady disclosed and discovered by divine revelation: an ancient picture upon a ruinous wall of an old Chappel, as it is thought, where the lame and blind have been presently cured, the matter throughly examined, the thing famous to al the citie, and testified this day by infinite concurse to pray there, by the continual Masses there from morning to noone, and specially by the wonderful offerings esteemed 20,000 crownes, to the building of a goodly church there, the foundation whereof is already laid. In 1588 S. Lorenzo in Panisperna was another very new church although it had been built on an older one. This was known also as S. Lorenzo in Formoso, a reference to Pope Formosus, who restored it. This name however was associated with such horrific events that it was abandoned. This church was thought to be located on the site where St. Lawrence was put to death: it housed these relics: an arm, part of the gridiron and some of the coal used to burn the saint. The illustration of S. Pudenziana is rather puzzling. In 1588 when the guide was published the façade was in the process of being rebuilt by Francesco da Volterra; this façade was replaced in 1870 by the current one. We know that the church was originally built on the site of Roman baths (Terme di Novato); it is possible that the three large arched openings were part of those baths. 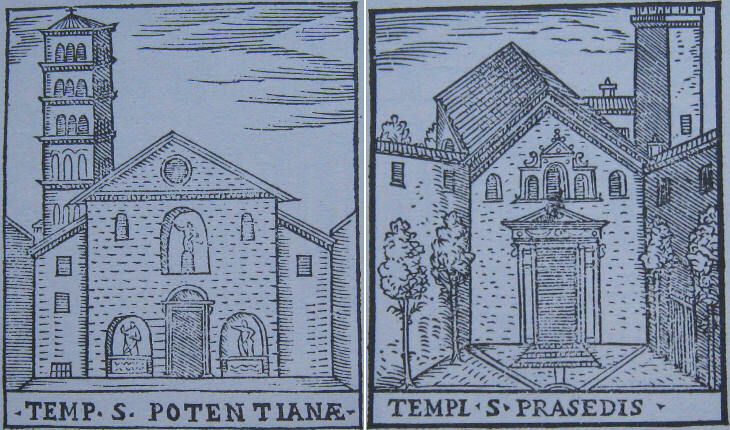 The illustration of S. Prassede shows the small façade of the church which is preceded by a courtyard. The decoration of the windows in its upper part was removed in 1937; this was part of a general action aimed at emphasizing the medieval aspect of many churches of Rome. In 1588 both this church and S. Pudenziana were credited with having a well which was filled with the blood of Christian martyrs: you might knele over the place where is a verie pitte or a well as it were of martyrs bloud, taken with a sponge and gathered into one place by Praxedes, the glorious virgin (Gregory Martin - Roma Sancta). In Italy herpes zoster (shingles) is called Fuoco di S. Antonio (St. Anthony's fire) a reference to miraculous healings from that disease which were performed by St. Anthony the Great. The saint was also credited with punishing perjurers with that same disease. For this reason the Romans believed that: (there is) the famous Aultar of S. Anthonie the holie Eremite, where such experience of Gods justice against false and blasphemous swearers hath been so manifestly declared that no Italian dare take an othe at that Aultar, which he knoweth false, for feare lest S. Anthonies fyre consume him, as there is at this day example thereof, a burnt carcasse under the Chappel doore (Roma Sancta). In essence this legend is similar to that of Bocca della Verità at S. Maria in Cosmedin. 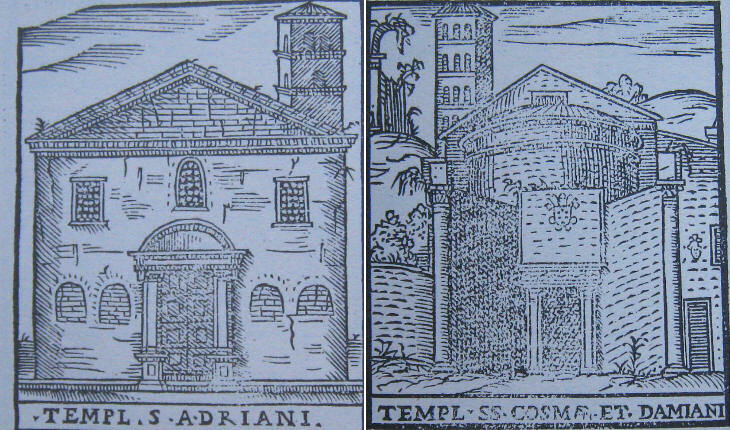 The illustration shows the church without the fine Romanic portal it has today; in 1588 it was at the entrance of the hospital which was located near the church. St. Eusebius was a martyr of the IVth century; however he was not the victim of Diocletian, Maxentius or Julian or some other pagan emperor. He was imprisoned in his own house at the request of Pope Liberius, whom Eusebius reproached for having betrayed the Nicene Creed to please Emperor Constantius who was an Arian. The façade of the church built on Eusebius' house was modified in the XVIIIth century. The guide describes a curious relic which was kept in this church: the bit of Emperor Constantine's horse which was made using a nail of the Holy Cross. S. Susanna was a medieval church located in an unpopulated part of the Quirinale hill until two events occurred: a) Pope Pius IV opened a street (Strada Pia) between Palazzo del Quirinale and Porta Pia (S. Susanna was placed at the middle point of the street); b) Pope Sixtus V built Mostra dell'Acqua Felice opposite the church. These changes led Cardinal Gerolamo Rusticucci and Camilla Peretti, sister of Pope Sixtus V, to promote a thorough restoration of the church. The large majority of the churches of Rione Monti were dedicated to martyrs of the Early Church and were located upon previous Roman buildings. This applies also to S. Vitale. He was a martyr, but there is uncertainty about the period during which he lived. According to the tradition he was first racked and then buried alive; the use of rack in antiquity is scarcely documented, while it was a preferred method of interrogation by the Inquisition. According to the tradition the church was built by Emperor Constantine at the request of Pope Sylvester I. We know that it was founded at the end of the Vth century by Pope Symmachus and it was dedicated to Sylvester. It is not exactly known when St. Martin of Tours (very popular for having shared his cloak with a beggar) was associated with the church. As a matter of fact the reference to this saint prevailed and the church is usually referred to as S. Martino ai Monti, although it is still dedicated to Sylvester too. This probably because there were other important churches bearing his name (S. Silvestro al Quirinale and S. Silvestro in Capite). St. Martin had just a very tiny church dedicated to him; it was located near Monte di Pietà and it was built by the pelamantelli, the manufacturers of cloaks. 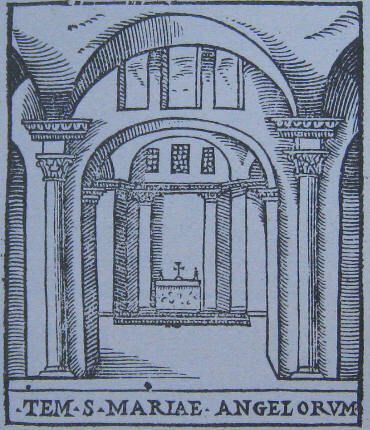 The illustration shows the church after St. Charles Borromeo built its fine portal, but before the changes made in the XVIIth century. The illustration of SS. Quirico e Giuditta shows the church during a period of transition: its entrance was towards S. Maria ai Monti, but in 1584 Cardinal Alessandro de' Medici (later Pope Leo XI) changed its orientation: this explains the unusual design of the façade. The level of the church was very low and the area was subject to floods, so in 1606-08 the building was modified in a significant manner; the current façade was built in 1735. The construction of S. Maria degli Angeli was mainly due to the efforts of Antonio del Duca, a Sicilian priest who fostered the veneration of the Seven Angelic Princes (three are well known: Michael, Raphael and Gabriel; four much less: Selaphiel, Jegudiel, Barachiel and Uriel). For more than 30 years he vainly asked the popes to dedicate a church to them. Eventually in 1561 Pope Pius IV agreed to turn the Baths of Diocletian into a church dedicated to Mary and the Seven Angels. Michelangelo was asked to develop a project; the fact that the pope was not prepared to face a big financial effort coincided with the desire by the architect to respect as much as possible the ancient building. The entrance was very simple and Michelangelo did not design a façade. 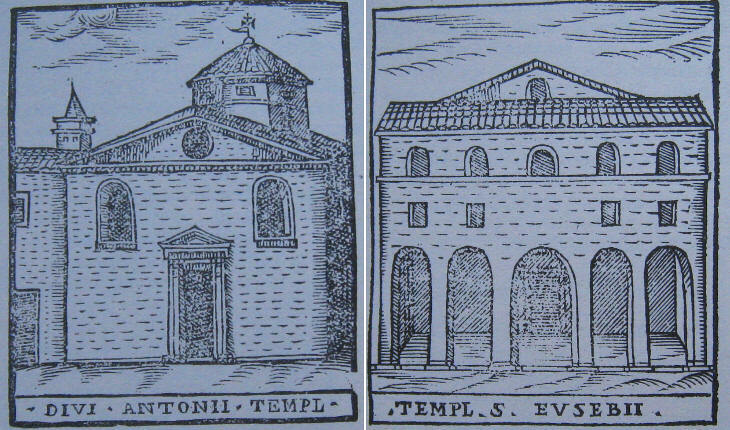 The illustration in the guide shows the interior of the church and highlights its imposing ancient columns. Introductory Page - The Seven Churches. The Churches of Trastevere and Borgo. The Churches near Via del Corso. The Churches in the Bend of the Tiber. The Churches of Ripa and Campitelli.